Rear Suspensions|Brandon, FL :: Scott's Automotive Inc. If a solid­ axle connects the rear wheels of a car, then the suspension is usually quite simple — based either on a leaf spring or a coil spring. In the former design, the leaf springs clamp d­irectly to the drive axle. The ends of the leaf springs attach directly to the frame, and the shock absorber is attached at the clamp that holds the spring to the axle. For many years, American car manufacturers preferred this design because of its simplicity. The same basic design can be achieved with coil springs replacing the leaves. In this case, the spring and shock absorber can be mounted as a single unit or as separate components. When they’re separate, the springs can be much smaller, which reduces the amount of space the suspension takes up. 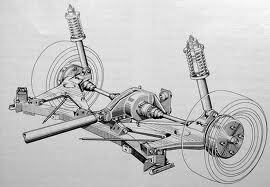 If both the front and back suspensions are independent, then all of the wheels are mounted and sprung individually, resulting in what car advertisements tout as “four-wheel independent suspension.” Any suspension that can be used on the front of the car can be used on the rear, and versions of the front independent systems described in the previous section can be found on the rear axles. Of course, in the rear of the car, the steering rack — the assembly that includes the pinion gear wheel and enables the wheels to turn from side to side — is absent. This means that rear independent suspensions can be simplified versions of front ones, although the basic principles remain the same.